Harrison Unger makes an absolutely hysterical Broadway debut in the Tony and Olivier Award-winning comedy The Play That Goes Wrong. Harrison plays Dennis Tyde and, within the show's play-within-a-play (The Murder at Haversham Manor), he's the loyal and dim-witted butler, Perkins. BroadwayBox talks with Harrison about how auditioning for this show was like auditioning for American Idol, his surprising favorite comedy film, and his most embarrassing stage mishap. 1. What was your audition like for The Play That Goes Wrong? What was the process? At what point did testing your physical comedy and improv come in? In many ways, it was a unique audition process reflecting the unique demands of the play. We were told up front that it would have three parts: an initial audition, a group callback, then a final callback. The first round was the closest to a normal audition, although members of the original company got up and read with me, which was quite exciting since I’d already seen the show. The second round had a bunch of us together in a rehearsal studio and got us on our feet with some very active improv games (I really enjoyed this part coming from an improv background myself) before breaking us into groups to read scenes. Then the final round was the next day onstage interacting with the set at the Lyceum Theatre: we all gathered in the downstairs greenroom area and were called up in various combinations to audition scenes—probably the closest I’ve ever come to an American Idol-type reality show experience, with anxiety to match. The biggest thematic through-line of the whole process was helpful guidance from the creative team that rather than parody, we should play straight the high stakes of the opening night performance for these hapless Cornley characters, letting the comedy always come from their honest emotional reactions to the things that go wrong for them, as well as their ill-advised solutions that inevitably make things worse. 2. Beyond the accent, how did studying at the British American Drama Academy help you with tapping into this character and this piece? I’m sure being in London and immersing myself in the fantastic London theatre scene during my time abroad at BADA helped in countless ways, but probably most directly useful for this show was a class I had at BADA called Modern Physical, taught by Mick Barnfather, a wonderful teacher and himself a member of the dazzling physical theater ensemble Complicité. Over the semester, we touched on all types of physical performance, among them clowning and mask work—both among my favorites, and both very helpful as a point of entry for The Play That Goes Wrong. Most of all, Mick’s sense of play, his infectious joy and fun in performing, left a major impression and is something that continues to resonate with me. 3. What comedy film is as close as perfect can be for you? When did you first discover it, and how has it grown with you? I was a Cinema Studies major in college so I feel like I should probably say something by Buster Keaton or Charlie Chaplin (and Keaton’s The General and Chaplin’s The Gold Rush are definite favorites of mine), but if I’m being completely honest the one that comes to mind is Ace Ventura: When Nature Calls. (Yes, I mean the sequel.) It was the first PG-13 VHS tape I ever had (a gift from my parents) and it's a miracle it didn’t combust considering the number of times I watched it. It’s Jim Carrey at the height of his zaniness, basically just a movie-length showcase for his absurd physical comedy, and the whole thing is so relentlessly silly that it will always hold a very special place in my heart. I remember rewinding certain scenes over and over while watching with friends and sliding off the couch from laughing so hard. Then years later, while studying abroad in college, a friend and I discovered we both loved this movie and went so far as to buy the region-specific DVD of it at a London grocery store just so we could watch it over there. (It held up.) The word…immature…is thrown around a lot when it comes to comedy, but that level of unabashed silliness will always tap me back into that delirious level of laughter I experienced watching it with friends as a little kid, and I don’t think I’ll ever grow out of that. I’d like to especially point everyone to a scene where Jim Carrey gets trapped inside a mechanical rhino and has to improvise a way out—not sure what it says about me that this is like my version of Proust’s Madeleine cookie, but whatever it is, I’m very much ok with it. 4. As a producer, J.J. Abrams helped shepherd The Play That Goes Wrong to its record-breaking Broadway run. What is your favorite all-time J.J. Abrams screen project? The man’s awe-inspiringly prolific so I have an ample selection of highlights to choose from, but I’m going to go with his TV series Fringe. I watched it back when it first aired and—along with the great performances, especially from Anna Torv and John Noble—I was really intrigued by the way it played with the idea of parallel universes and how it managed to engage with lofty subjects and emotional terrain while always maintaining a sense of humor. I’ve always been very interested in stories that blend the scientific with the metaphysical—shows like Legion and Stranger Things are recent examples—and Fringe was one that got me hooked early on, pondering a lot of fun thought experiments. 5. Can you tell us a bit about the worst onstage mishap you’ve experienced? Appropriate to our show, I’ve experienced and witnessed many. But my favorite would be my junior year of high school, when I was playing Macduff in our production of The Scottish Play. Our set had some steep-ish, painted plywood stairs that led up to where the castle’s bedrooms were supposed to be, and our costumes were admirably medieval-looking and period-specific, including kilts and broadswords (which we got to fight with—very exciting). The only problem was the boots I was given to wear were a suede-type material, including the soles, which didn’t leave much in the way of traction. So right in the midst of one especially dramatic scene as I was running up those steep-ish stairs, I slipped on the edge of one step and my foot rocketed out from under me. Thankfully I was able to catch myself right away and avoid completely banana-peeling it, then I just kept on going as if nothing had happened. But after the show once I’d changed out of costume and met up with my friend and his younger brother in the audience, my friend (barely hiding his grin) said that after watching the play his brother had figured out what he was going to get me for my birthday. I asked what, already laughing. His brother’s answer? “A StairMaster." 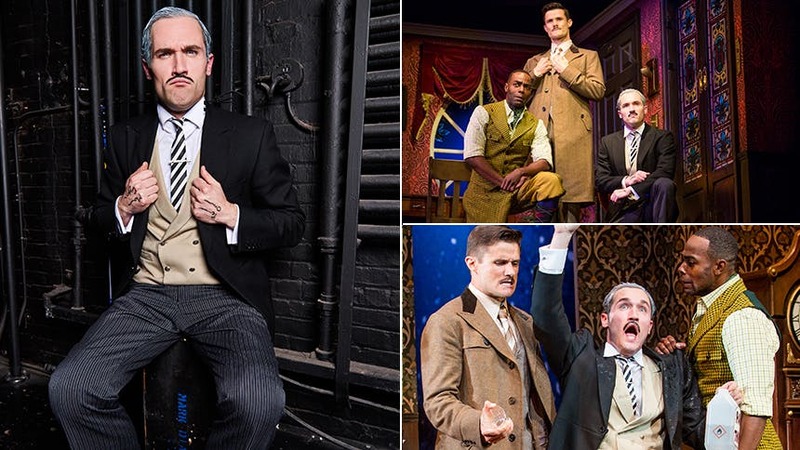 Don't miss Harrison Unger in "The Play That Goes Wrong" at Broadway's Lyceum Theatre through January 6, 2019.